May is Arthritis Awareness Month. Support your loved one battling Arthritis with our unique and inspiring Fighting Back Rheumatoid Arthritis Awareness T-Shirt. Our Arthritis Awareness T-Shirt is great for giving hope and spreading awareness so that people living with the Arthritis disease may lead effective and fulfilled lives. 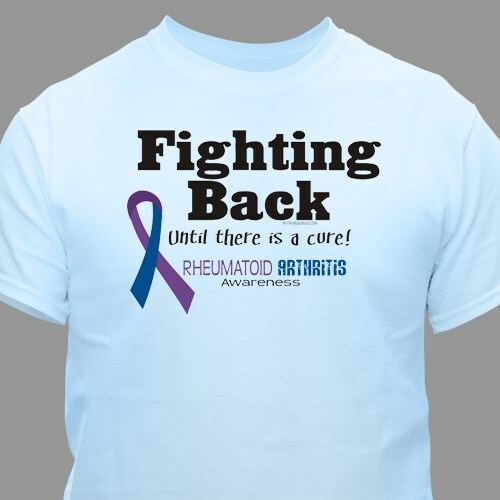 This fighting Back Rheumatoid Arthritis T-Shirt is available on our premium 100% cotton T-Shirts, machine washable in youth sizes XS-L and adult sizes S-3XL. The T-Shirts are very well constructed and made true to size. The fit, and feel, are extremely comfortable. I would definitely buy again from MyWalkGear.com!! Good quality shirt. The only disappointment I had was that your picture had a bright fuchia pink t-shirt, and in the options of colors (and was what I wanted), but I only saw pink as an option, so I chose it. When I received the shirt, I got a pale light baby pink shirt...not at all what I wanted (I am not a light pink fan), so I am not sure how much I will wear the shirt...would have really preferred the darker pink color that was pictured. You probably should be more clear on colors so that no one else has this same issue.